We’ll talk a little bit about cholesterol. 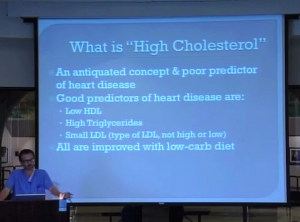 Basically, the concept of “high cholesterol” is out of date. They discovered early on that people who had exceedingly high total cholesterol had a high risk of having a heart attack. But then, they came along and they said, “Cholesterol is not just whether it’s high or low, it depends on your HDL because HDL is actually good. You want HDL cholesterol to be high.” And then they said, “Part of the cholesterol is called ‘triglycerides,’ which is a type of VLDL cholesterol.” And they said, “High triglycerides, that’s the risk for heart disease.” And it still is a risk factor. And then they said, “LDL is your bad cholesterol.” They said, “You don’t want your bad cholesterol to be too high.” They don’t actually measure LDL, they calculate it. And the thing about LDL cholesterol is it doesn’t actually matter if your LDL is high or low. What matters is whether your LDL particles are small or large. And small LDL particles put you at risk for heart attack. And this is something that your doctor’s never measured. He’s probably never measured your small LDL. That’s why there’s a sheet toward the back of the handout that says to take to your doctor things for him to measure on you, and one of them for him to measure is your small LDL. And all of these are improved with a low-carb diet. Your HDL gets better, your triglycerides get better, your small LDL changes to large LDL. It gets better when you eat a low-carb diet. What are my blood lipids? So normal triglycerides — this is my blood work — normal triglycerides are 10-150. Mine are 43. I’m eating fat, saturated fat, protein and vegetables, all day every day, all the eggs I want, all the bacon I want, all the sausage I want, and my triglycerides are 43. My HDL, which is my good cholesterol, is 55 – normal is 29-71. This is an interesting point here, this “lipoprotein, beta, serum, quantitative, calculated” — this is the LDL, this is what they call the LDL in this printout — it’s calculated, they don’t measure it. They take your triglycerides and your HDL, and they calculate what they think your LDL is. So this doesn’t really tell me anything about my LDL because I need to know if my LDL is small or large, and they didn’t measure it, they just calculated it. So when you see your doctor you should have them actually measure your small LDL. These are the risk factors, we talked about that, we’ll hit that again later. When your body is getting rid of all the fat, your body is dumping all the fat out of your fat tissue and you’re burning it as fuel, that requires a lot of HDL cholesterol. So HDL is not something you can eat, HDL is not something you can improve by taking a pill. If you want to improve your HDL cholesterol, you cut the killer carbs. If you have high HDL it’s actually a marker that your metabolism is going the way it’s supposed to go, that your fat is burning and that you’re not burning sugar. 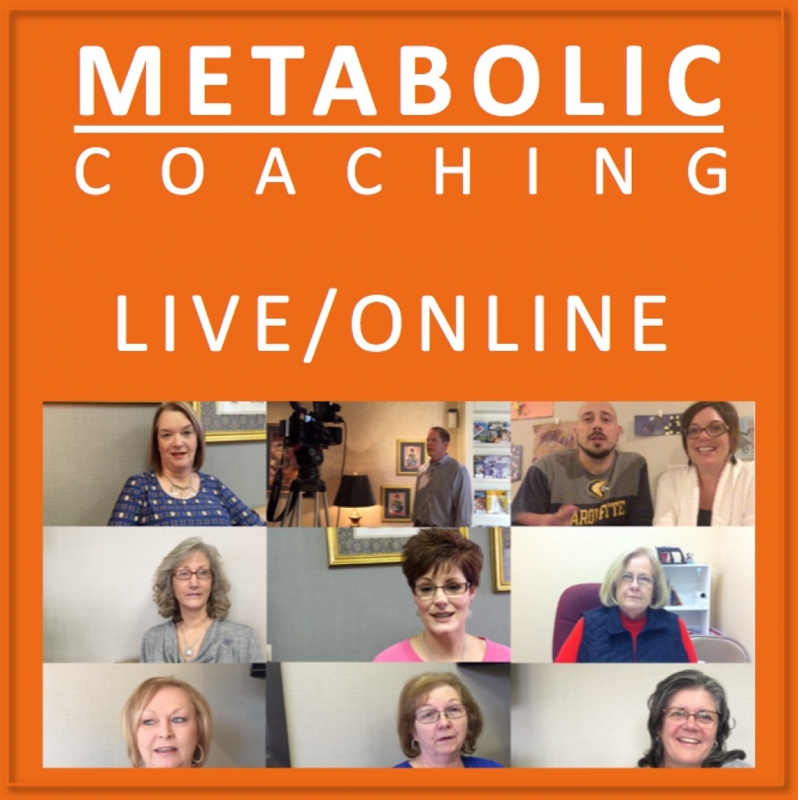 Just for a second, we talked about insulin as what causes fat growth, insulin is what makes us fat. 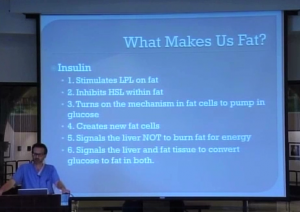 And these are the ways that it happens: basically, insulin stimulates everything it can stimulate to put fat into that fat cell, and it inhibits everything to let fat out of the fat cells. So if you want to release the fat out of your fat cells, you want to improve your cholesterol and your blood pressure, all you have to do is to not eat the killer carbs and if you don’t eat the killer carbs you don’t produce all the insulin. 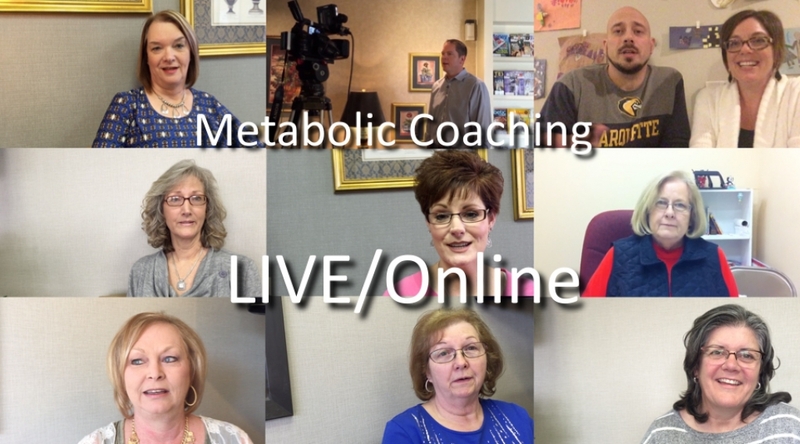 We talked about this, it’s the insulin than makes you tired and lethargic. Some people think, “I don’t go to the gym, I don’t exercise enough, that’s why I’m overweight.” But it’s backwards. You’re actually overweight and your fat tissue and your insulin is keeping you from going to the gym and having the energy that you need. This shows a cycle here, it’s from a textbook. Well, basically these fatty acids circulating in your blood, there’s two things that can happen: they either go into the cell or they come out of the fat cell. And what you want is you want for them to come out of the fat cell. And the only thing that you need to get the fat out of your fat cell, there’s one hormone that needs to be down or decreased, that’s your insulin. I was watching an episode of either Maury Povich or Jerry Springer. 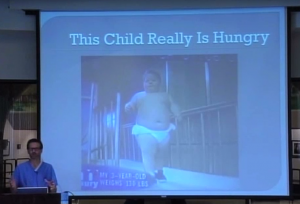 This was years and years ago but I remember there was this obese child, and the mother said, “Oh, my baby’s hungry, he’s hungry all the time, I gotta feed him, I can’t not feed my baby, he’s hungry all the time.” And he is. He is hungry all the time because they feed him carbohydrates, and in two hours his blood sugar dips down, blood sugar dips down low and when it dips down low, he’s hungry. If you feed him carbohydrates he’s gonna be hungry and hungry and hungry and hungry. That’s one of the great things about eating low carb. If you cut the carbs out of your diet you’re not hungry all the time. Because your blood sugar is not crashing every two hours. So basically, the carbohydrates are what increase your blood sugar, and that increase in the blood sugar is what increases the insulin. And the insulin is what causes the fat growth. And also, the blood sugar and the insulin contribute to all of those diseases that we listed before. So you want to cut the killer carbs to decrease all those diseases and the medications you take.